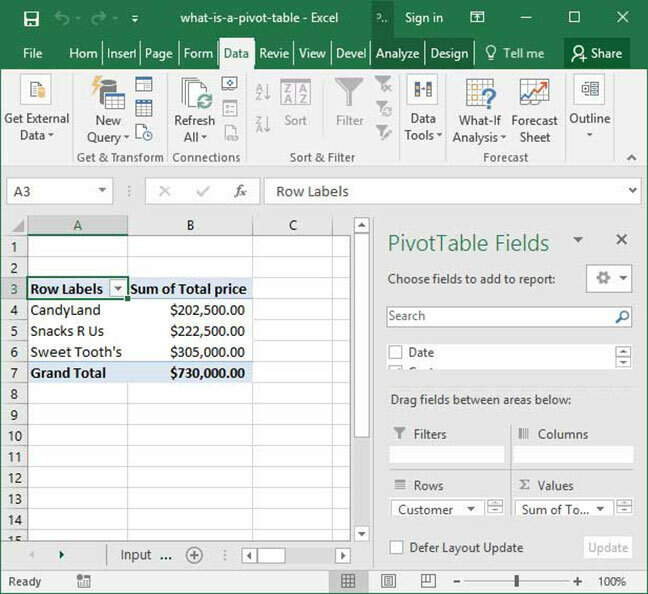 If you're a beginner or intermediate Excel user, you may have heard mention of Pivot Tables. This tool is an incredibly important part of any analyst's Excel toolkit, and appears frequently in Excel-based job interviews like the Uber Analytics interview. But what is a Pivot Table, and how can it help you analyze data more effectively? In this article, we'll go over the basics of Pivot Tables, explaining what they are and how to use them in practice. Simply defined, a Pivot Table is a tool built into Excel that allows you to summarize large quantities of data quickly and easily. Given an input table with tens, hundreds, or even thousands of rows, Pivot Tables allow you to extract answers to a series of basic questions about your data with minimal effort. 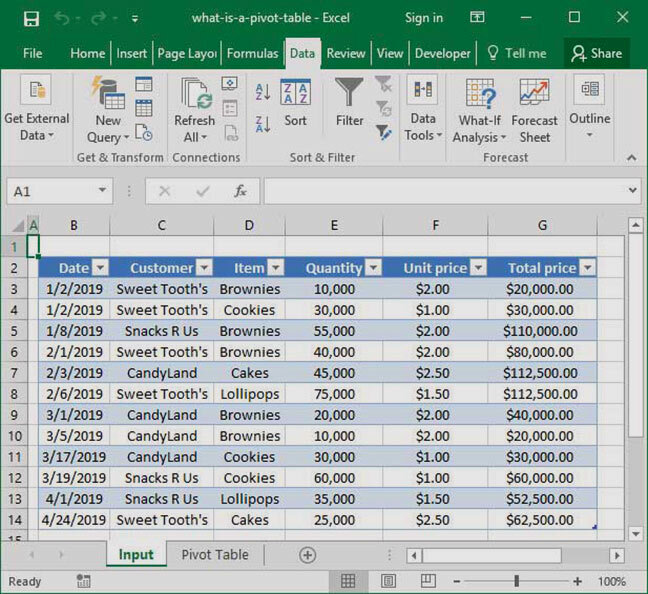 That may all seem a bit abstract, so let's dive into a real-world example to get an idea of what a Pivot Table really is. Take a look at the below spreadsheet, which is an individual list of SnackWorld's sales to customers by date and item type. The below example only contains twelve rows, but it's important to note that what we're about to discuss also applies to much bigger spreadsheets — our sheet could just as easily contains hundreds or thousands of rows, making it much more difficult to analyze via conventional means. She could add each customer's sales up by hand. But we know that this approach is inefficient. It is time-consuming, prone to human error, and infeasible if the sheet in question contains hundreds or thousands of rows. She could use a SUMIF formula. A SUMIF formula would help our analyst sum up sales by customer (for more information, check out our SUMIF tutorial). But it would take time to write the formula, and our analyst might miss a customer or two if the list is particularly large. Neither of the above options will work particularly well for our analyst. Enter Pivot Tables. This tool will allow her to quickly sum up sales by customer with minimal effort. So, what does using a pivot table to perform these calculations look like? Check out the below example, in which we've used the tool to complete the task above: summing sales dollars by customer. This report was prepared in about 30 seconds based on the input data tab. Notice a couple of things: it's captured the data we wanted (the sum of the Total Price column, segmented by customer); it has included a comprehensive list of customers on our input sheet; and it's set up for flexible adjustments and modification (see the Pivot Table Field List dialogue on the right-hand side of the screen). Our analyst's problem is solved. Create a breakout summary of orders by customer, month, and item type. The above is just a small subset of ways we could leverage Pivot Tables to analyze our sheet. Once you're familiar with their basic functionality, you'll find that this incredible tool can be applied to numerous analytical scenarios, greatly speeding up your Excel work in a number of different situations. So, how are Pivot Tables used, and how can we set one up based on our data? Read about how to make a Pivot Table to find out. Questions or comments on this explainer? Be sure to let us know in the Comments section below. We love to hear from you.